My review copy: Won in a Twitter contest. Seventeen-year-old Lauren is having visions of girls who have gone missing. And all these girls have just one thing in common—they are 17 and gone without a trace. As Lauren struggles to shake these waking nightmares, impossible questions demand urgent answers: Why are the girls speaking to Lauren? How can she help them? And… is she next? As Lauren searches for clues, everything begins to unravel, and when a brush with death lands her in the hospital, a shocking truth emerges, changing everything. With complexity and richness, Nova Ren Suma serves up a beautiful, visual, fresh interpretation of what it means to be lost. "Girls go missing every day. They slip out bedroom windows and into strange cars. They leave good-bye notes or they don't get a chance to tell anyone. They cross borders." "My heart had an irregular beat that I can almost hear again now, like an extra thump was thrown in to make me think there were two hearts in the van, thumping." "Gone, I said. That's the only word I could think to call what ha happened to my 17-year old neighbor: She was gone." "It was here that the smoke of the dream seemed to clear and her hair parted and I could see her face for the first time since it appeared in my bathroom mirror." "How heartless it was for a girl to be forgotten and buried before there was even anything of there to put in the ground." This book was creepy but in a good way. This is definitely not my usual type of read but when I won the book from Penguin on twitter I thought why not give it a try and boy was I surprised by how much I liked it. First of all the cover is both creepy and gorgeous if that is even possible! Lauren sees girls who have gone missing. They are all 17 years old. As the story unfolds she collects more and more girls. All who have different personalities and different reasons for having gone missing. She wants to try to save them all and help them find their way home to their families. The first night I starting reading 17 & Gone I had strange dreams. When I got in my car in the morning I had no desire to look in my review mirror. This is a testament to Nova Ren Suma's writing skills. The way she beautifully describes everything almost like painting a picture in your mind left me scared and fascinated. There were times that this book got a tad slow for me but it did not make me put it down. 17 & Gone touches on a couple of very real issues. Both of which I think were very well done. First we have all the missing girls and the fact that many children go missing everyday. As a single mother to a 12 year old this is one of my biggest fears and one that crossed my mind more than once while reading this book. Especially when Lauren is reading the missing persons posters for the girls who have gone. The second issue that this book touches on is equally well written and researched. I don't want to give anything away so you will just have to read to find out. This was my first time reading a book by this author and it will not be my last. Suma has a way of making you feel like you are right there in the story. She paints a very clear picture. 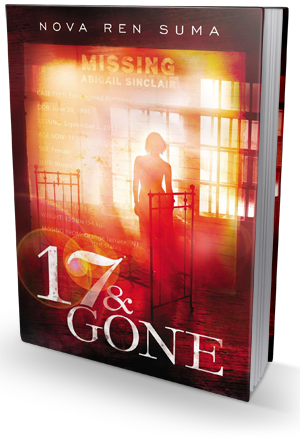 Suma is an amazing storyteller and 17 & Gone is a beautifully written, creepy story.